Warning: Your world is smaller than you think. If you can’t see it, and now you don’t hear it, does anything even exist outside your Sennheiser-induced Bubble? Once upon a time, I thought I knew what I wanted. I craved tech that screamed bigger and louder. My dream was to create the ‘man cave’ where I’d have the biggest flat screen hanging proudly on my wall, bookended by some awesome surround-sound speakers. What could be better than creating your own little movie theater from Elysium? …along with how and when I consumed my media. Fast forward to three years later, and I’ve finally decided the only reliable way to consume a complete TV episode is to turn the whole equation on its head and forget about my aging 42” plasma screen. The fickle fancy of consumer tech has been innovating in a different direction anyway. Today, it’s all about how small you can go! A good pair of noise-cancelling headphones, and you’re in your own world. As a road warrior on my daily train commute, I’ve accomplished just that with my Bose headphones and iPhone. Who needs a home theater, when you can watch whatever you want in your little mobile tech bubble wherever you go? And that Bubble has great value even when you haven’t left the house. Today, people are consuming vast quantities of content on their smartphones and tablets from the comfort of home. But the personalized multimedia experience served up for one isn’t a new concept. Throw on a pair of earbuds and jack them into your computer, and you’ve got the same experience… just more tethered. Which brings me back to the other immobile screens in your home. If they had feelings, I’m sure they’d be really lonely. And very jealous of their tiny digital cousins you’ve been hanging out with lately. I’ve got one little fellow to the left of my iMac in my home office. He’s a cute, 21” Sony flat screen connected to my cable TV box. I only have to swivel slightly to readjust my gaze between the two. And he often sits there, dark… brooding… staring at my always-active iMac. Even my three year old doesn’t ask to turn the Sony on. He finds Disney programming on my iPad much more compelling. Of course, the simple answer is just plug a pair of headphones into the TV. That way, I won’t disturb the rest of my world when catching a noisy scene from The Bourne Legacy on HBO. My silly Sony TV doesn’t have a headphone jack. Time to buy a pair of wireless headphones. Cordless headphones usually roam free by relying on their transmitting partner/base to remain connected your audio source with an old-fashioned cable. But without a headphone jack on the TV, you’ve got to access your audio source another way. Bluetooth is all the rage, but the quality isn’t as good as the others. RF-based wireless technology is mature, but it can suffer from interference from other tech in your home. All this said, RF appears to be the standard bearer if you want to own a great pair of wireless headphones. You can easily spend somewhere between $200-$600 for top-rated wireless headphones. I like great tech as much as the next nerd. Extending my Bubble to include my little TV isn’t at the top of my tech budget. But I also don’t want to buy a cheap pair of headphones that hardly work. As I considered my conundrum, I kept coming across a pair of old 900MHZ RF Sennheisers online that were once at the top of their class, but have long been bested by newer versions. They’re the Sennheiser RS 120. They retail for $99 on Sennheiser’s website. But you can pick them up on Amazon for $78.10. And at that price point, they’re hard to beat. 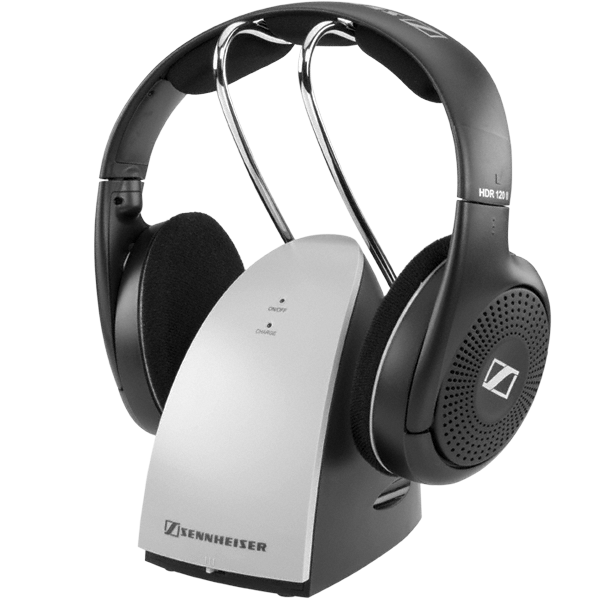 Sure, they can’t compete with Sennheiser’s top-of-the-line RS 220 for $599. But I don’t need them to rock my world. I’m not building a home theater. An empty tin can with a string would probably do if I could figure out a way to connect it. Little Sony flat screen- welcome back into the Bubble.